With the White House daily changing key elements of its account of the killing of Osama Bin Laden – he turned out not to be armed, did not use his wife as a shield against Navy Seal bullets and she wasn’t killed (so it was always a shoot-to-kill mission and Osama was not a gutless coward) – it might be prudent to also take the charges of duplicity and double-dealing being leveled at Pakistan with a large spoonful of salt. An old colleague from Northern Ireland, Toby Harnden, who wrote one of the best books yet on the IRA in South Armagh and is now the US editor of The Daily Telegraph, has listed ten questions about the operation in Abbottabad which he thinks throw doubt on the authorized explanation and instead support the theory that Bin Laden was betrayed by someone in his compound. The story put out by Obama’s people, the central feature of which was that months-long tracking of one of his couriers led to the Al Qaeda chief, is designed, Toby suggests, to throw everyone off the scent. I’m not entirely persuaded. For instance he asks why Obama did not just blast the compound with missiles instead of mounting a risky helicopter assault? His answer is that it was done this way so the informer would live to spend the $25 million reward money. Well, if a source inside the compound was working for the Americans couldn’t they have warned him instead to arrange to be elsewhere at the time the missiles struck? 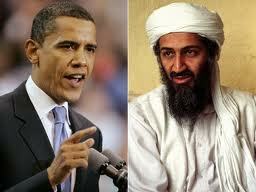 And if missiles were used and the compound obliterated what proof would there be that Bin Laden was dead? It would be like Obama’s birth certificate all over again, but worse. There would be no office in Hawaii that could gallop to the rescue with the requisite long-form proof. But I have had experience myself of this sort of intelligence trickery and feel that Toby’s questions are therefore worthy of consideration. Over the years I also have learned the wisdom of Izzy Stone’s old dictum: “All governments lie”. 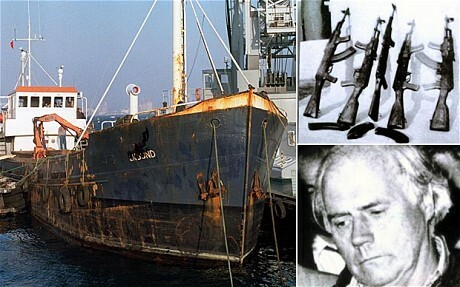 When the Libyan arms ship, the Eksund was captured off the French coast in 1987, stuffed to the gunwales with weapons for the IRA, the British put out the story that the discovery was entirely accidental. The Eksund’s rudder had malfunctioned, we were told, the boat drifted and attracted the suspicious attention of the French customs service which boarded the boat where, lo and behold, they discovered Gaddafi’s arsenal. In fact we now know that the British had known about the Libyan smuggling operation for some time, tipped off at a senior level within the IRA and had been following the Eksund almost from the moment it left Tripoli harbor. The cover story was concocted – and likely the rudder sabotaged – to protect the British source inside the IRA. The fact that Osama Bin Laden had been living under the noses of the Pakistani government in a lavishly protected compound within walking distance of the local equivalent of West Point or Sandhurst is being taken as evidence of the Pakistanis’ duplicity, pretending to be America’s ally while subsidizing the Taliban and turning a blind eye to Al Qaeda. The notion that the Pakistani government, or an important element of it, did not know about the raid strains credulity. Why send in helicopters, across Pakistani airspace and spend 38 minutes on the ground with the very real risk that Pakistani forces might suspect a terrorist attack and come and check it out? A highly possible outcome of such recklessness would be a firefight between SEALs and Pakistani troops or police. Again there are holes in this hypothesis, two large ones in particular. The Americans could have kept the mission secret from the Pakistanis until the moment the helicopters landed, but once the commandos were in the compound they could have been informed and told to stay away. And since the Americans were in the compound for some forty minutes there was plenty of time to get that message through to the Pakistani authorities and therefore to obviate any risk of an armed clash between them. 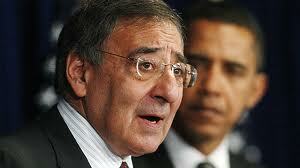 The authorised version of the raid on the other hand, particularly that put about by CIA chief Leon Panetta, paints the Pakistan government as a feeble, untrustworthy but essentially helpless tool of the Americans, unable to prevent the US riding roughshod, John Wayne-style, over local sensitivities as the country’s national sovereignty and pride was sullied by American troops behaving as if they were in North Carolina and not on Pakistani soil. Coming after Pakistan’s recent failure to bring an alleged CIA agent to justice for killing two of its citizens and the massive civilian death toll wreaked by Obama’s Predator Drones in the country’s border region with Afghanistan – events which have unsurprisingly angered many Pakistanis, especially those of a more fundamentalist Islamic bent – it seems that hiding Pakistan’s alleged co-operation with Washington in the way Toby suggests would actually cause the government much more trouble. Why do that when the effect could be to destabilize a secretly helpful ally? However, Toby is not the only commentator whose judgement I would respect to suggest that the Pakistanis may indeed have had a hand in Osama’s death. 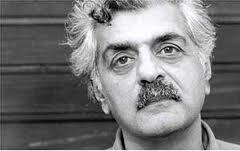 Tariq Ali, whose writings on his native land are always entertaining and informative (his family and social connections with Pakistan’s elite are impressive), had a piece in the London Review of Books earlier this week saying just that. And he goes on to give what to me is the most believable explanation yet why Pakistan would want to shelter Bin Laden and keep his whereabout hidden from the Americans. The event took me back to a conversation I had a few years ago. This makes a lot of sense. The Americans give the Pakistanis $3 billion every year, most of which goes to the military, at least ostensibly. They do that because of the threat posed by the Taliban and Al Qaeda. Kill or hand over Al Qaeda’s leader and the air might well go out of the Taliban’s balloon. If the war in Afghanistan diminishes or ends as a consequence then Pakistan can kiss goodbye to its annual US largesse and to the large slice that is likely creamed off the top. In a country where only a tiny percentage of the population pays income tax and the elite thrives on corruption and graft, giving Bin Laden to the Americans would be irrational. But who knows whether any of this has any basis? Probably not, but experience has taught me to treat everything that is said or written in the immediate aftermath of events like the operation in Abbottabad with a healthy degree of scepticism. The full or proper truth about such matters always takes time to emerge, not least because there’s always someone whose interests would be threatened otherwise. How long did it take, for instance, for the full story of the IRA’s 1981 hunger strike to emerge and isn’t it striking, now that it has, how different that episode now looks? At the same time there is something offensive about the superior way so many in the mainstream American media are dumping on the Pakistanis over the Bin Laden hideout, sneering patronizingly on cable TV shows that the authorities were bound to know given that Bin Laden was living in such a heavily guarded compound, so close to Pakistan’s West Point in a town so heavily populated with retired military types. It is not that the logic is faulty. Those are valid reasons for suspecting that the heads of Pakistani intelligence knew all there was to know about the Bin Laden sanctuary and that he may have been living there under their protection. It’s more the near racist arrogance that is annoying, the assumption that of course such a thing would never happen in America, that a wrong-doer of such notoriety couldn’t possibly hide in plain sight in the US. It’s only in countries like Pakistan that such things happen and we all know why, nudge-nudge, wink-wink. Except that’s not quite correct, is it? 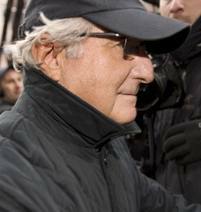 Remember Bernie Madoff, the Wall Street stock broker and hedge fund fraudster who operated a vast Ponzi scheme for the best part of forty years before he was caught. Admittedly he didn’t kill 3,000 people in a couple of hours or persuade his followers to fly planes into skyscrapers as Bin Laden did but he ruined and impoverished thousands of lives in a scam that cost some $50 billion, the most expensive swindle in American financial history. So many people knew about Madoff’s fraud or strongly suspected it over the years yet nothing happened. Boston-based investor Harry Markopolos, for example, got onto Madoff‘s scam in the late 1990’s when he reverse engineered his financial performance and found such perfection to be an impossibility. He reported Madoff to the Securities and Exchange Commission, which supposedly regulates the financial markets five times between May 2000 and April 2008 but there was no follow up. Not a thing. all. The major Wall Street investment banks and derivative firms all avoided him like the plague because “they didn’t think his number were for real”. Madoff’s operation stank and the insiders all knew it. And the reason Madoff survived, right in the heart of Wall Street, surrounded by Wall Street executives? Well basically the same reason, if Tariq Ali is correct, that the Pakistani military establishment covered up for Osama Bin Laden for so long. Too many people were making lots and lots of money out of him. Why kill or blow the whistle on the goose that lays all those beautiful golden eggs?